Free film screening on the Thursday 28th March 2019, 19:30 - 21:30, at the University of Sheffield Students' Union (Nelson Mandela Auditorium) - open to all! 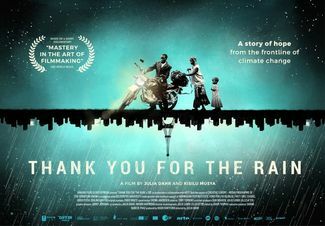 This film tells the story of a Kenyan farmer whose livelihood is damaged by the effects of climate change. Driven by the desire to protect his family and community from these effects worsening in the future, we see him transform into an environmental activist on a global scale making it all the way to COP21 in Paris. Come along to our event to experience his incredible journey! As well as showing an incredible journey of a truely inspirational person, we hope this event will show how everyone of us can act upon climate change. Before and after we will be running a couple of stalls too where you will have the opportunity to find our more about what you can get involved with in your local area or University, how you can most effectively reduce your carbon footprint, and we'll even be providing free postcards for you to write and send to your MPs to act upon climate change. This event is open to everyone - students, members of the public, medical professionals and anyone in between! We will also be providing FREE TEA AND COFFEE from Coffee Revolution before the event - make sure you get here a bit earlier so you don't miss out!